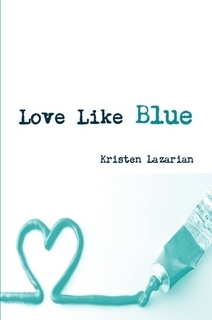 Love Like Blue explores the real life complexities of human partnerships, as three couples face the demise of their relationships in Act One. But life is a cycle, and endings always lead to beginnings. The character Felix writes, “We’re connected whether we like it or not. 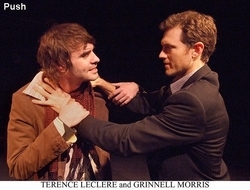 The dance itself never ends.” The same characters meet and start anew in Act Two. A unanimous RAVE at Los Angeles Times Calendar Live! Marital games are put into play and no one is without fault in this dark comic examination of love, manipulation, fidelity and deceit. Do all men cheat? And will women, with one little push, fall easily into adultery? Push will twist your perception, force you to question, and will make you laugh at identifiable human frailty. Flesh and Tenderness tells the story of Olivia, a fourth generation Armenian-American woman, who comes to terms with her family’s history during the Armenian genocide because of her fiancé’s business relationship with a Turkish American man. 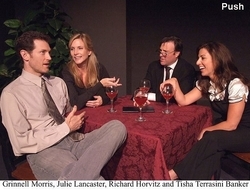 The play takes place in the San Francisco Bay Area. Inviting Karma takes place over the course of one late summer day at a small coffee shop in a desert town. Only the most faithful regulars will venture out into the heat for Audrey's cold cactus soup special that usually comes with a good story on the side. In Audrey's cafe on this strange day, the past collides with the future and in the explosive intersection where these people meet, karma rearranges and recreates. Inviting Karma is about the journey to discover the forces which shape us and the ways we sabotage our personal growth. Between You & Me tells the story of Herb, a bachelor business man, and his accidental telephone affair with Candice, a woman he’s hired and who he actually hates in person. A comic romp about love in the era of modern technology, Between You & Me looks at how the technology that connects us can also divide us. Inviting Karma takes place over the course of one late summer day at a small coffee shop in a desert town. Only the most faithful regulars will venture out into the heat for Audrey's cold cactus soup special that usually comes with a good story on the side. In Audrey's cafe on this strange day, the past collides with the future and in the explosive intersection where these people meet, karma rearranges and recreates. Inviting Karma is about the journey to discover the forces which shape us and the ways we sabotage our personal growth. Two women, Jan and Pam, sit in a bar, looking at men, unwittingly inverting the male gaze with both bad judgment and comical desperation. 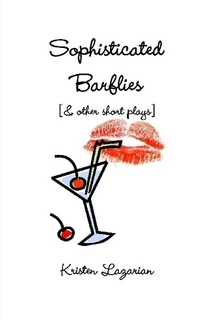 Included in Sophisticated Barflies [& Other Short Plays]. Missy meets Buddy as they are going up to the 999th floor on an elevator. Unfortunately for them, what goes up must go down. Joy Ride is rough romp through the highs and lows of a relationship. Haley and Brian, meet by accident in various settings over the course of a few months. Hard as they try, they can’t quite make the connection that fate would seem to have them make. Nicky just went through a bad break up with Max. Recovery often takes time and a really patient friend who will nurse your wounds. Even if it takes three years. When Emily is confronted by Joe after a Romantic Poetry class, she admits that he reminds her of her ex. But Joe also has a confession. Now all they have to do is figure out if familiarity alone can right the wrongs of the past. Zoe is just trying to read her book at the beach, but she is interrupted by guy after guy playing volleyball nearby. With each attempt to seduce her, Zoe simply turns it around and hands them back their balls. Donna finds her old journals ruined by flooding in the attic. As she mourns a past she can’t recover, she also confronts a future full of both freeing and frightening unknowns. When some very bad Actors and an ambivalent Director decide to do a play, no one is more dismayed than the Playwright. He decides to fix his play as it is being performed, demonstrating that even the most trivial drama becomes sacred when you are in—as he deems it – the Church of the Pen. Ivy is in the throes of a depression so she decides to go into hibernation for the winter until her well-meaning but ill-advising friends try to lure her out. Part dream, part wake-up call – Ivy finds out that all things are new in springtime. Smith Taylor and Mary Jones try to report the news, but in their Los Angeles market, celebrity gossip, dishonest political stories and all other kinds of bad news trump substance. Mary doesn’t care, but Smith begins to wonder. Mary gets desperate to keep Smith spewing gossip for ratings. But Smith realizes that he can have it both ways, even if it gets him fired. Bridget comes home from college and has to deal with the young, naïve but fast Birdie. Bridget tries to explain to Birdie the real inner workings of smart girls, but Birdie is not one to listen. But time tells how Birdie becomes all that Bridget hopes for and more. A love triangle in three parts. Harry falls in love with Rune. Harry thinks Rune is a witch. Rune’s sister Enya up and moves to Alaska with her inattentive boyfriend Ethan. Enya gets Ethan’s attention when she burns down the diner where they are having breakfast. Needless to say, Enya comes back home where she inadvertently meets Harry, who previously loved Rune. Their circuitous route to each other leads to a love that is both suspect and possibly long-lasting.